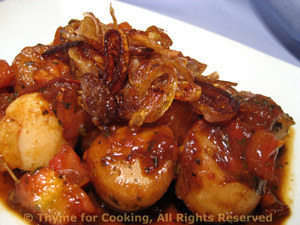 Seared Scallops with Browned Shallots, quick, easy gourmet dinner. 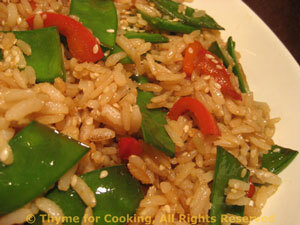 Snow peas and red peppers make a colorful, crunchy Pilaf to go with the Seared Scallops. Use the larger sea scallops for this if you can..... And let the shallots get very crispy. Scallops are best when cooked quickly over fairly high heat. Overcooking tends to make them tough. Add shallots and sauté until brown and crisp, 15 - 20 minutes. Remove and set aside. Turn heat up to medium-high and add scallops. Fry until lightly golden, then turn and fry the other side, 4 - 5 minutes total. Scallops are done when they turn opaque. Reduce heat to medium, add tomato and stir-fry quickly, 1 - 2 minutes. Add vinegar, soy sauce, basil, paprika and simmer 1 - 2 minutes longer. Spoon sauce over shallots, top with browned shallots and serve.